In the manifesto, titled "Jan Ghoshna Patra" in Rajnandgaon, which is the constituency of Chief Minister Raman Singh, the Congress has promised immediate farm loan waiver within 10 days. Rahul Gandhi at Darbarsahib Gurudwara in Rajnandgaon in Chhattisgarh. 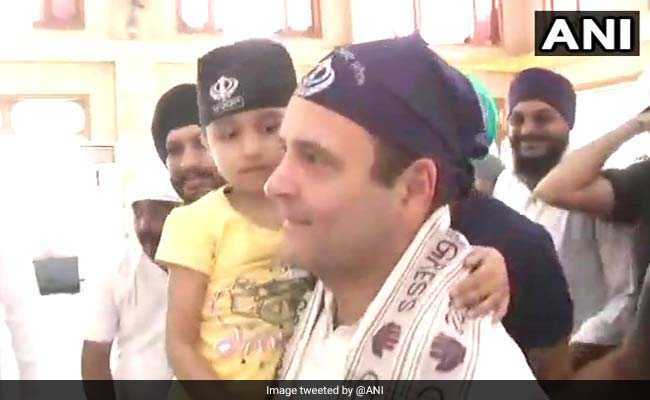 Congress president Rahul Gandhi offered prayers at Darbarsahib Gurudwara in Rajnandgaon on Saturday, a day after releasing the party's manifesto for Chhattisgarh assembly elections. In the manifesto, titled "Jan Ghoshna Patra" in Rajnandgaon, which is the constituency of Chief Minister Raman Singh, the Congress has promised immediate farm loan waiver within 10 days, better healthcare facilities and a safer society for women in the state. During his public address, Mr Gandhi criticised the Bharatiya Janata Party(BJP)-led central government's decision to implement demonetisation and the Goods and Services Tax (GST). He also alleged that no other prime minister ruined the country's economy as much as Prime Minister Narendra Modi did. The assembly elections in the state will be held in two phases, on November 12 and November 20. Counting of votes will be on December 11.